Winemaker’s Notes: Intense ruby red. Intense and ruby red, mingling notes of leather and spice with subtle woody aromas. Full-bodied attack, evolving with a fine tannic structure, to offer spicy flavors and long, fresh, aromatic finish. Perfect compliment to grilled beef and strong cheeses. My Review: I’m just going to lead off with something – I really liked this wine. Whether it was the wine and the pairing, just the wine, or something else, it’s hard to say (wine and food is a whole experience a lot of the time in my opinion), but I’m just going to go out there, not bury the lede, and let you know from the get-go that this is one I’d buy again. Alright, into why I’d buy it again. The wine was a nice ruby color, though I don’t know that INTENSE is the word I’d use. It was nice. It was a nice ruby red. On the nose I picked up aromas of violet, spice, and ripe red fruit. In the mouth the wine showed spice (nutmeg), soft oak, and tart red fruit, with lots of spice on the finish. My wife and I paired the wine with some NY strips that we seasoned, grilled, and topped with some reserved sauce from when we made the Chrissy Teigen steaks a bit ago. I really enjoyed this wine – it was very sippable (helped by a 12.8 alc/vol), but the spice and fruit were well balanced and did a great job of going with the steaks. At the price it’s a great value, and one I would certainly buy again (as I said above); it’s right in that range to share with friends at a dinner party, but also something you can enjoy on the regular at home without feeling guilty or that you need a special occasion, which is the best kind of wine really. 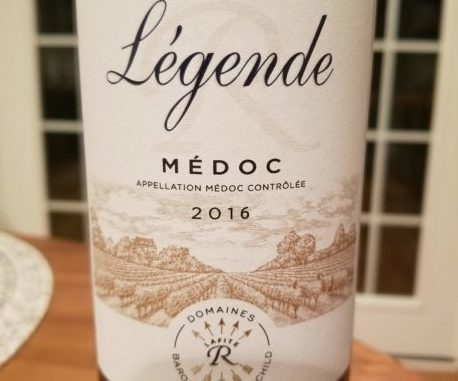 We’re early into the year, but the 2016 Legende Medoc has certainly been a highlight for me, and one I hope finds its way into my bar again soon.